This article is about the Bar Kochba era fortress. For other uses, see Betar (disambiguation). Walls of the Betar fortress. Betar fortress (Hebrew: בֵּיתַּר) was an ancient, terraced farming village in the Judean highlands. The Betar fortress was the last standing Jewish fortress in the Bar Kokhba revolt of the 2nd century CE, destroyed by the Roman army of Emperor Hadrian in the year 135. The site of historic Betar (also spelled Beitar or Bethar), next to the modern Palestinian village of Battir, southwest of Jerusalem, is known as Khirbet al-Yahud in Arabic (meaning "ruin of the Jews"). 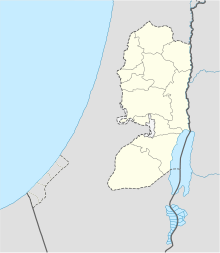 Today, the Israeli settlement and city Beitar Illit is also located nearby. According to Jewish tradition, the fortress was breached and destroyed on the fast of Tisha B'av, in AD 135, on the ninth day of the lunar month Av, a day of mourning for the destruction of the First and the Second Jewish Temple. The city was the stronghold of Bar Kokhba, the leader of the Jewish Revolt against Hadrian. Hadrian sent against the city several of his Roman legions to capture the city. According to historical records, the city was besieged for three and a half years before it finally fell, and its defenders (including children who were found in the city) were put to death. The horrendous scene after the city's capture could be best described as a massacre. 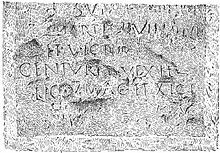 A stone inscription bearing Latin characters and discovered near the city shows that the Fifth Macedonian Legion and the Eleventh Claudian Legion took part in the siege. The destruction of Betar in 135 put an end to the last great Jewish revolt against Rome, and effectively quashed any Jewish hopes for self-governance in that period. Following the Fall of Betar, the Romans went on a systematic campaign of wiping out the remaining Judean villages, and hunting down refugees and the remaining rebels, with the last pockets of resistance being eliminated by the spring of 136. "Through the shaft of a litter Bethar was destroyed." It was the custom when a boy was born to plant a cedar tree and when a girl was born to plant a pine tree, and when they married, the tree was cut down and a canopy made of the branches. One day the daughter of the Emperor was passing when the shaft of her litter broke, so they lopped some branches off a cedar tree and brought it to her. The Jews thereupon fell upon them and beat them. They reported to the Emperor that the Jews were rebelling, and he marched against them. [In explanation of the verse] "He hath cut off in fierce anger all the horn of Israel." R. Zera said in the name of R. Abbahu who quoted R. Johanan: These are the eighty thousand battle trumpets which assembled in the city of Bethar, when it was taken and men, women and children were slain in it until their blood ran into the Great Sea [=Mediterranean]. Do you think this was near? It was a whole mile away. It has been taught: R. Eleazar the Great said: There are two streams in the valley of Yadaim, one running in one direction and one in another, and the Sages estimated that [at that time] they ran with two parts water to one of blood. ...Rab Judah reported Samuel as saying in the name of Rabban Simeon b. Gamaliel; What is signified by the verse (Lamentations 3:51), "Mine eye affecteth my soul, because of all the daughters of my city?" There were four hundred synagogues in the city of Bethar, and in every one were four hundred teachers of children, and each one had under him four hundred pupils, and when the enemy entered there they pierced them with their staves, and when the enemy prevailed and captured them, they wrapped them in their scrolls and burnt them with fire. The Jerusalem Talmud relates that the number of slain was so enormous, that the Romans "went on killing until their horses were submerged in blood to their nostrils," and that the flow of blood overturned large stones in its course, and that when the flow of blood travelled along a riverine brook at a distance of 40 biblical miles to the Mediterranean sea, the red hue from the blood of the slain could still be seen in the sea at a distance of 4 biblical miles. Such hyperbolic speech was used only to emphasize the horrendous scene after the capture of the city, and the ensuing massacre of its inhabitants. The same account reports that the corpses were collected and used to make a hedge around the vineyard belonging to Hadrian, and which hedge stretched many long biblical miles and was as high as a man's stature. Hadrian had prohibited their burial, and so all the bodies remained above ground. Miraculously, they did not decompose. Many years later Hadrian's successor, Antoninus (Pius), allowed the dead to be afforded a decent burial. Wikimedia Commons has media related to Betar (fortress). ^ David Ussishkin, "Soundings in Betar, Bar-Kochba's Last Stronghold"
^ D. Ussishkin, Archaeological Soundings at Betar, Bar-Kochba's Last Stronghold, Tel Aviv 20, 1993, pp. 66-97. ^ K. Singer, Pottery of the Early Roman Period from Betar, Tel Aviv 20, 1993, pp. 98-103. ^ Palestinian Talmud, Taanit 4:5 (24a); Midrash Rabba (Lamentations Rabba 2:5). ^ C. Clermont-Ganneau, Archaeological Researches in Palestine during the Years 1873-74, London 1899, pp. 263-270. ^ Mohr Siebek et al. Edited by Peter Schäfer. The Bar Kokhba War reconsidered. 2003. P160. "Thus it is very likely that the revolt ended only in early 136." David Ussishkin, "Archaeological Soundings at Betar, Bar-Kochba's Last Stronghold", in: Tel Aviv. Journal of the Institute of Archaeology of Tel Aviv University 20 (1993) 66ff. Prof. David Ussishkin, Soundings in Betar, Bar-Kochba's Last Stronghold. Other Midrashic sources can be seen here. This page was last edited on 27 March 2019, at 09:09 (UTC).